BSNL Broadband re-launches high-Speed Unlimited two Broadband plans on promotional basis for a period of 90 days under FMC Broadband services. State runs Telecom Company Bharat Sanchar Nigam Limited (BSNL) based on feedback received from customers of has decided to re-launch popular Broadband plans BBG Combo ULD 1090 CS74, BBG Combo ULD 1291 CS75 (FMC plans) in selected districts as promotional basis under Broadband services. BSNL First Broadband plan BBG Combo ULD 1090 CS74 of Rs.1090 gives 2Mbps speed upto 25GB data usage following Pre FUO beyond 512Kbps. Second BBG Combo ULD 1291 CS75 Unlimited Broadband plan of Rs.1291 gives 2Mbps speed utpo 35GB (Pre FUP) and after 512Kbps speed under Unlimited Broadband services. As well, BSNL allows users Free Unlimited calling during night hours (i.e.09:00 PM to 07:00AM) on any network in India. BSNL facilitates annual payment option for its customer for One year, where customer will get one month (Two and Three years payment is not available) free FMC (Fixed Monthly Charges) discount under annual payment option. Customers really benefit with this annual payment option can avail un-interrupted services to avoid disconnection on monthly payment if delayed or late payment. 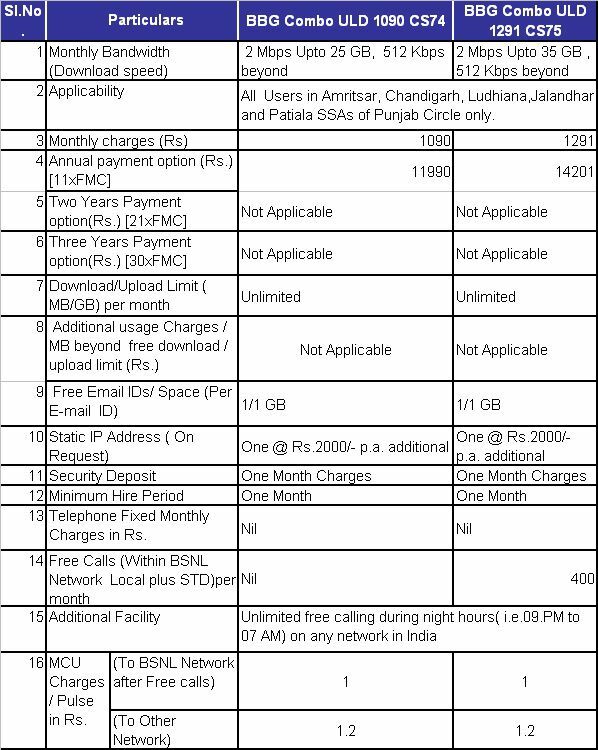 BSNL will collect one month plan FMC charges as security deposit and BSNL provided one free email ID with 1GB email storage and static IP address on paid basis on customer request for the above denomination plans. The above Unlimited Broadband plans will be implemented with effect from 9th December, 2015 for a period of 90 days as promotional basis. This offer is applicable in Amritsar, Chandigarh, Ludhiana, Jalandhar and Patiala service area of Punjab Telecom Circle.